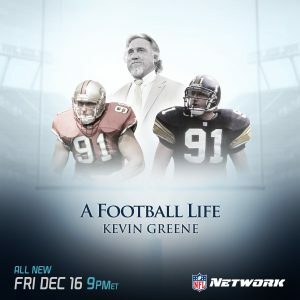 The sixth season of NFL Network’s Emmy-nominated series A Football Life Presented by Gillette continues Friday, December 16 at 9:00 PM ET with a profile of Hall of Fame linebacker Kevin Greene. The one-hour show produced by NFL Films features sitdown interviews with Greene, his wife Tara, former coaches Dom Capers and Bill Cowher, former teammates Rod Woodson and Jackie Slater, former Green Bay Packers quarterback Brett Favre, Green Bay Packers linebacker Clay Matthews, family members and more. Each episode of A Football Life – as well as all NFL Network programming – is streamed live on the NFL Mobile from Verizon app (NFL.com/mobile) and via Watch NFL Network on tablet (NFL Mobile and Watch NFL Network apps), PC (NFL.com/watch), Xbox One and Xbox 360(NFL on Xbox app) and other connected TV devices (NFL app on Apple TV and Playstation 4). During his 15-year career, Kevin Greene became one of the most dominant pass rushers in the history of the NFL. His 160 sacks are the most all-time by a linebacker, and he is one of just three players to record at least 10 sacks in at least 10 seasons. Kevin Greene: A Football Life examines Greene’s playing career, his intensity and discipline, and his induction into the Pro Football Hall of Fame.